Glen Lusby “Designer on Call” Mart Design Center features a standard bearer of imported and domestic fine textiles, Scalamandré continues its legacy of traditional, historic, classic and contemporary designs creating luxurious, high-end fabrics, wallcoverings, trims, furnishings and accessories. A destination since 1929 for fine design and all things beautiful, Scalamandré’s signature classics, and fresh new collections, infuse style, elegance, and vitality to the rooms of today and tomorrow. In addition to continuing its eponymous brand, Scalamandré now adds to its family the prestigious Old World Weavers and Grey Watkins brands, as well as Boris Kroll. This company also represents renowned international brands, such as Lelievre, Colony and Missoni Home. We invite you to see the Scalamandré Showroom with Glen Lusby, Designer on Call, at the Merchandise Mart Design Center. Choose a fabric to create your own luxury furniture with special trim or recover your existing furniture to bring a fresh new look to your home. Let Glen Lusby help you find that special fabric to frame your Windows and bring a new comforting look to your home. Find a special fabric for a bedroom headboard or create a one of a kind Coverlet or Duvet. You will also see a unique collection of wallcoverings and furnishings that will highlight every room. Contact us with questions about your home or commercial space, interior design or design services. Call me at 773-761-6950 or just CLICK HERE to send an e-mail. Click on the “Recent Posts Menu” on your right or simply scroll down to see more Luxury Furniture, Rugs, Textiles & Lighting design posts. SHOP THE FINEST IN HOME FURNISHINGS – Explore with Glen Lusby Interiors at The World-Famous Chicago Merchandise Mart Design Center – Call us at 773-761-6950, GAIN ACCESS TO COWTAN & TOUT LUXURY TEXTILES AND WALL PAPER, PLUS OVER “100” INSPIRING TRADE ONLY SHOWROOMS FILLED WITH EVERYTHING YOU NEED TO FURNISH YOUR HOME OR OFFICE. Cowtan & Tout offers five distinct brands of the world’s finest decorative luxury textiles: Colefax And Fowler, Cowtan & Tout, Jane Churchill, Larsen and to Manuel Canovas. Cowtan & Tout is a unique offering of elegant, colorful and timeless designs. Its collections offer a wide range of decorative choices with an American point of view. Tradition is reinterpreted for a modern, classic interior. Cowtan & Tout offers an eclectic selection of prints, wovens, silks, sheers, leathers, trimmings, and wallpapers. You can see all of this and more with your “Designer on Call” complementary tour of the World Famous Chicago Merchandise Mart “Design Center”. To schedule your appointment call 773-761-6950 and ask for Glen. Colefax And Fowler holds a unique place in twentieth-century decorating history. It’s heritage is the embodiment of John Fowler and Nancy Lancaster’s impeccable taste. Each new collection upholds the tradition of the brand, inspired by the historical palette and range of patterns, expanding on the company’s chintzes, woven fabrics, silks, sheers, trimmings, and wallpapers. Jane Churchill collections are known for being fresh, relaxed and easy-to-use, often with a contemporary twist. The large selection of prints, wovens, checks, stripes, wallpapers, and trimmings always feature a fantastic range of appealing colors, rich textures and distinctive prints. Each new range is linked by theme and color, making it easy to coordinate and layer in an individual way to create any look you want. The French fabric house, Manuel Canovas is internationally renowned for the quality of it’s textiles and vivid colors. Essentially European, the Manuel Canovas unequaled color philosophy is the foundation of all the collections. The luxurious weaves and stunning prints are instantly recognizable by their unusual color harmonies. The high style prints, wovens and wallpapers make Manuel Canovas textiles a distinct choice for interiors. Glen Lusby is a “Designer on Call” and we invite you to see and shop on 4 floors of Trade Only Showrooms in Chicago’s Historic Merchandise Mart “Design Center”, in the heart of downtown Chicago. The Design Center is the worlds largest resource for custom home furnishings and interior design. Over 100 Trade Only Showrooms offer the finest luxury lines and brands available only to interior design professionals. To see our Design Center Page just click: World Famous Chicago Merchandise Mart . Would you like to know more? Call Glen Lusby Interiors and schedule your complementary Designer on Call “Design Center” consultation appointment now at: 773-761-6950. Explore with Glen Lusby Interiors, at the Merchandise Mart “Design Center”, and Design Centers in New York, Florida, Las Vegas Nevada, California and Furniture and Accessory sources in Europe. 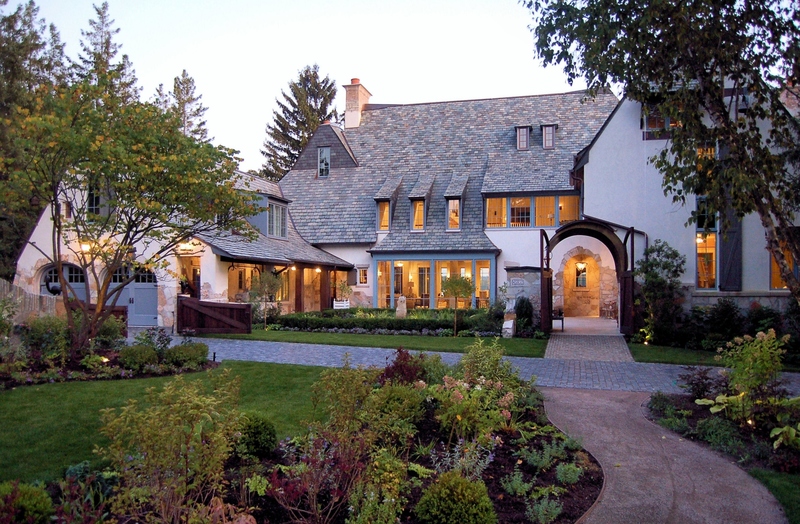 Click on the photo above to see interior and exterior photos of this Luxe Magazine award-winning Geneva Lake property. Interior Design by Glen Lusby. Luxe interiors + design Magazine has placed us on their National Gold List for our work on a stunning & graceful Geneva Lake Home. The Luxe Magazine National Gold List represents interior designers, architects, builders, and landscape architects who had their projects featured in the “Home Features” editorial section of the Luxe interiors + design Magazine. This magazine publishes the work of more design professionals than any other magazine of its type! with Rich Textures and Engaging Art. At 72 stories and 90% Sold, it’s easy to see how The Legacy at Millennium Park rises above the crowd. However, it’s the Legacy’s incredible location, gracious homes and exceptional amenities that ultimately take city living to new heights. This luxury condominium property features 1, 2 and 3 bedroom residences and superior penthouses. To see more photos of the Legacy Condominiums see our February 14 post,click the sidebar menu or just scroll down. In this post we feature unit 5202 with fabulous views from the condominium. If you would like more information about purchasing one of these Luxury Condominiums in Chicago , please contact George Schultz, a skilled Real Estate professional, @ Properties 773-537-1285. If you would like more information about Glen Lusby Interiors; the furniture in the unit or on our website; or any other interior design question, please call Glen at 773-761-6950. See this collection & more, explore with Glen Lusby Interiors at The World-Famous Chicago Merchandise Mart – Call the 773-761-6950, GAIN ACCESS TO OVER 100 INSPIRING TRADE ONLY SHOWROOMS FILLED WITH EVERYTHING YOU NEED TO FURNISH YOUR HOME. Click – www.glenlusbyinteriors.com -to see our design for Single Family & Condominium Homes. We work from a design contract, and encourage our clients to take advantage of purchasing items from the 4 floors of Trade Only Showrooms in Chicago’s Historic Merchandise Mart, in the heart of downtown Chicago, and from our work rooms and other sources in New York, California and Europe , where we can discount the the merchandise from the normal retail pricing. As part of the Chicago Merchandise Mart Properties Designer on Call Program, we invite our clients to shop on 4 floors of Trade Only Showrooms in Chicago’s Historic Merchandise Mart in the heart of downtown Chicago, The Design Center is the worlds largest resource for custom home furnishings and interior design. Over 100 Trade Only Showrooms offer the finest lines and brands available only to interior design professionals. Luxe interiors + design Magazine has placed us on their National Gold List for our work on a stunning & graceful Geneva Lake Home (Click Here) click on the Luxe icon when you get to the page. The Luxe Magazine National Gold List represents interior designers, architects, builders, and landscape architects who had their projects featured in the “Home Features” editorial section of the Luxe interiors + design Magazine. This magazine publishes the work of more design professionals than any other magazine of its type! As long as you are here and after you have read our posts, please see our “Best Picks” as well as our “Sale & Event’ pages, just click on the toolbar above. We would like to be your trusted consultant for any interior design question or questions about design services. Please call me at 773-294-2781 or just CLICK HERE to send me an e-mail. front-row seat as Chicago comes alive each day in vibrant color, motion and sound. Indeed, the legacy is located at the central core of the city, with The Art Institute, Symphony Center, theaters, Magnificent Mile shopping and world-class dining within easy walking distance. In this post we feature unit 5201 and 5202 with interiors by Glen Lusby Interiors, and fabulous views from the condominium. If you would like more information about purchasing one of these Luxury Condominiums in Chicago , please contact George Schultz, a skilled Real Estate professional, @ Properties 773-537-1285. If you would like more information about Glen Lusby Interiors; the furniture in the unit or on our website; or any other interior design question, please call Glen at 773-761-6950. See this collection & more, explore with Glen Lusby Interiors at The World-Famous Chicago Merchandise Mart – Call the “DESIGNER ON-CALL” at 773-761-6950, GAIN ACCESS TO OVER 100 INSPIRING TRADE ONLY SHOWROOMS FILLED WITH EVERYTHING YOU NEED TO FURNISH YOUR HOME. We work from a design contract, and encourage our clients to take advantage of purchasing items from the 4 floors of Trade Only Showrooms in Chicago’s Historic Merchandise Mart, in the heart of downtown Chicago, and from our work rooms and other sources , where we can discount the the merchandise from the normal retail pricing. Luxe interiors + design Magazine has placed us on their National Gold List for our work on a stunning & graceful Geneva Lake Home (Click Here) & click on the Luxe icon when you get to the page. The Luxe Magazine National Gold List represents interior designers, architects, builders, and landscape architects who had their projects featured in the “Home Features” editorial section of the Luxe interiors + design Magazine. This magazine publishes the work of more design professionals than any other magazine of its type! As long as you are here and after you have read our posts, please see our “Best Picks” as well as our “Sale & Event’ pages, just click on the toolbar above. We look forward to using this vehicle to bring our friends news, tips and information about great people, places and things as we discover them. We encourage you to use this vehicle and our Facebook page to interact with us; tell us what you like or just say hello. We would like to be your trusted consultant for any interior design question or questions about design services. Please call me at 773-294-2781 or just CLICK HERE to send me an e-mail.